"For a second thing, I am sure now that we were overoptimistic in our judgment of the mood of the public. What we mistook as general resentment against the System's abrogation of civil rights during the Gun Raids was more a passing wave of uneasiness resulting from all the commotion involved in the mass arrests. "As soon as the public had been reassured by the media that they were in no danger, that the government was cracking down only on the "racists, fascists, and other anti-social elements" who had kept illegal weapons, most relaxed again and went back to their TV and funny papers. "As we began to realize this, we were more discouraged than ever. We had based all our plans-in fact, the whole rationale of the Organization-on the assumption that Americans were inherently opposed to tyranny, and that when the System became oppressive enough they could be led to overthrow it. We had badly underestimated the degree to which materialism had corrupted our fellow citizens, as well as the extent to which their feelings could be manipulated by the mass media. "As long as the government is able to keep the economy somehow gasping and wheezing along, the people can be conditioned to accept any outrage. Despite the continuing inflation and the gradually declining standard of living, most Americans are still able to keep their bellies full today, and we must simply face the fact that that's the only thing which counts with most of them. I wrote this in reply, and reading it again after hitting the post button, I decided that I wanted it here as well. The Turner Diaries is a pretty repugnant piece of writing. But I think that the thing that really bothers me about it is just how much truth (of the sort that we really don't want to admit to ourselves is actually true) is in there. The quote you mention is one of those truths. There is another book I've recently read, Neither Predator Nor Prey, that makes a very similar point. That book is about gun confiscation, and it makes the point that there are only a relatively few people who would actively be involved in either confiscating or in resisting confiscation--the vast majority of the population simply would not give a crap and would watch from the sidelines. Map that to what you see in the real world every day, and you really start to understand that both authors have some keen insight into people. In our own history, the Revolutionary War was only fought be a fraction of the population. Ditto the French Revolution and the population of France. Most "wars of revolution" are like this. Some people just want to be left alone. Many seem to lack the capacity to be concerned about things greater than themselves. Some just don't care. But the inaction of this vast majority emboldens the "bad guys"--rather than 80% of the population being against them, it's only 5% or 10%. They realize that if they can beat those and throw the rest a pizza and a six pack, they'll stay on the couch. That's the danger of a large, complacent population. It why our Founders did everything they could to both get people to be involved with their government and to restrict the franchise to those who were most likely to get and stay involved. Now, we've made it so easy (motor voter, absentee balloting for everyone, etc.) to vote that we're getting people who's idea of original thought is what was on the last bumper sticker they saw voting en masse, and with predictable results. It's all about "What free stuff can I get out of the government?" rather than "What's good for the US and my descendants?" We're going to pay for this. It's just a question of when. From the looks of it, you would eat well and have a pretty fair varity of food. No "diet boredom", which is doubly important under stressful conditions. 3000 calories per day allows for a lot of hard work, such as cutting wood or heavy garden work. It would be marginal for a warrior in combat. Police say Leonard Ray Isenhart Jr., 18, of 422 W. Sixth Ave., first tried to steal the purse of an unknown elderly woman and was attempting to run through the grocery exit around 2 p.m. when the second woman, who was entering the store, grabbed him. Isenhart then reached for her purse and pushed her to the floor, causing minor injuries to her hands and knees, an incident report said. Another witness then tackled Isenhart and held him with the help of Walmart employees until Lexington Police Department officers arrived. Gang tackle if you have to, but don't let them get away with it. The Lexington, NC Wally World will now be safer, if only for a while. Also notice that this police force doesn't trot out that "Leave it to the professionals" crap. You have to love life in the South. The buyer's remorse is setting in as Obama's policies fail. It's interesting to note that the numbers are pretty close to the numbers I've seen for people who self-identify as "liberal" or "conservative". Expect several sharp policy related changes of course in the next 2-3 weeks if this holds up. As with Clinton before him, The One is driven in large part by polling numbers. Can you ping your pistol? I heard about this on the podcast version of Guntalk, and I really had to wonder if it was April 1--RFID tags in pistols? What kind of idiot company would do that? H&K for one. SIG for another (same link). As expected, some are poo-pooing and fitting those who disagree for tin foil hats. Feel free, but I don't want anyone who can afford a $19 RFID reader from eBay to be able to scan me (especially from close range), find out that I'm armed, and with exactly what, right down to the serial number. This is a stupid idea. I'm not in the market for a new pistol right now, but if I were, guess what brands I wouldn't be looking at? I've been wanting to write a blazing condemnation of socialized medicine/nationalized medicine/single payer insurance/health care farting unicorns for a while, but I've kept putting it off. Good for me. Because I can now send you along to the best condemnation of that system ever written. Kevin at The Smallest Minority has hit one out of the ZIP code. Before you go clicking on the link, let me warn you of two things. First, there is a story with accompanying photo that is going to break your heart. If you love kids and the thought of their mistreatment causes you great anguish, then don't click. I'm not kidding here, because this is pretty ugly. Second, if that ever happened to one of my kids, I promise you that everyone involved would pay in the same currency as Fabio Alves-Nunes paid for their failings. The US medical system is horrible--just as long as you don't compare it to any of the others. With all it's problems and failings, I'd still rather get sick here than anywhere else in the world. Because here, you have the best chance of getting well. The best of anything is expensive. Deal with it. Which brings us back to the ammo shortage. In ordinary times, I would not be paying any attention to stocks of ammunition, nor to anybody who was concerned about where they were going to get their next bullet. I'm generally in favor of gun control, at least to the extent that I don't think the average citizen (or garden-variety thug) needs access to semi-automatic weapons. Now that I am aware of the ammo shortage, I am wondering what I could shoot. Would shoot. A redcoat, definitely. A squirrel, but only if I was down to 65 pounds and the lifetime supply of brown rice I'm building up and that will hopefully be in place before TEOTWAWKI arrives is completely depleted. I'm confident I could wave the thing around with a great deal of eye-popping menace and hopefully scare off whoever's looking to steal my rice, my strawberries or my virtue. Mike thinks it's "nicely written". From a technical standpoint, he's correct. But was was noted in another post, this thing deserves a heaping serving of hearty ridicule. It is no more than the bleating of a sheep who has just scented a wolf. The sheep is darting about, baa-ing in panic, but unable to do anything constructive (outside of hoarding brown rice). If the TEOTWAWKI event that she poo-poos actually does occur, I'm sure her virtue, strawberries and brown rice will make a tasty snack for some predator. Lady, you need to wake up, and soon. Welcome to the new economy! We're all laughing our asses off watching! On one side, IOU recipients are beginning to trade them like currency, forcing the California state treasurer's office to issue guidelines if they are sold through eBay, Craigslist or other means. Meanwhile, Bank of America, Wells Fargo, JP Morgan and Citigroup, among others, have said they will stop accepting the IOUs on Friday, according to a report in The Wall Street Journal. But to make matters even more entertaining, the Fiddlin' Government, in the guise of the SEC, is stepping in to help. Speculation is rising over whether California's tax-exempt IOUs, technically registered warrants, can be bought, sold and traded. The Securities and Exchange Commission must first determine if the IOUs are securities to regulate them, said Ernesto Lanza, general counsel to the Municipal Securities Rulemaking Board, adding that the board was not working directly with the commis—sion on that decision. "It looks like it has all the hallmarks of a security," Lanza told Reuters. "If they are securities, I think they're pretty clearly municipal securities." And the laughter gets louder and louder. Next up--a rousing chorus of "We told ya this would happen!" On a serious note, though, get ready. They can't let California fall, no matter what. Whatever they do--including nothing--will make it worse. If you aren't ready now, you time is getting very short. Sorry--I guess I geezed out for a second. Anyway, Ars Technica has a good article on pinball machines, collecting and restoration thereof. Think using less electricity will save you money? I can remember the old public service announcements in the 70s exhorting everyone to save energy and save money at the same time. Fast forward to a new century. Some Missouri residents and businesses soon could see a new charge on their electric bills — a fee for using less energy. Though it might seem illogical, the new energy efficiency charge has support from utilities, most lawmakers, the governor, environmentalists and even the state’s official utility consumer advocate. The charge covers the cost of utilities’ efforts to promote energy efficiency and cut power use. The assumption is that charging consumers for those initiatives ultimately will cost less than charging them to build the new power plants that will be needed if electricity use isn’t curtailed. I note they used the word "assumption", not "logic". We have seen similar moves relating to gasoline taxes as consumers shifted their behavior by buying more efficient cars in response to high gas prices. The reduction in gas tax collections have caused some states to attempt to enact a "per mile driven" tax scheme in addition to the gas tax. This nonsense has been overcome by the application of voter outrage, as voters shifted their behavior from being fleeced like sheep to growling like wolves. Perhaps the voters of Missouri need to do some growling of their own. Government needs to understand that its our money, not theirs. Don't be an irrational idiot, just take it and say "Thanks!" The Ultimatum Game, in which test subjects respond to take-it-or-leave-it offers, has allowed psychologists to explore how humans handle issues like fairness and punishment. But a new study shows some people attempt to punish even when the rules of the game are stacked in a way that makes it impossible. Explains a few things, doesn't it? 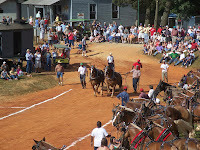 It seems to be turning into an Independence Day tradition--a visit to the Southeast Old Threshers Reunion in Denton, NC. 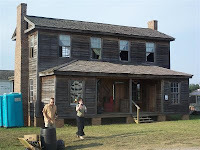 This is the Reid Plantation house. As with all the historic buildings at the Denton Farmpark, it was moved here so that it could be preserved for future generations. (No, in its original state it did not come with the portajohn.) Note how the chimneys are on the outside of the home--this is a southern adaptation to the high heat of summer, serving to keep as much heat out of the house as possible if it were necessary to use the fireplaces during warm weather. Another innovation which we don't have a picture of was the "summer kitchen"--a separate kitchen that was used during summer to keep the heat completely out of the house (and during harvest time to speed up the processing of food). This house also comes with a smoke house, corn crib, threshing house and many of the other outbuildings a well-equipped farm of the 1800s would have had on hand. 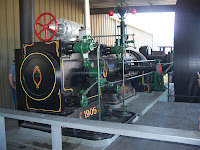 We have a 1905 Bates-Corliss steam engine, of just the sort to run a large mill. This one actually did run one for over 30 years. See the large vertical black thing at the far right of the picture? 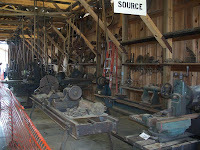 That's the flywheel, which was cast in two pieces and weighs over 12,000 pounds. 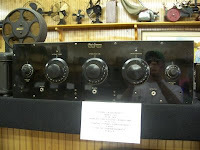 Advancing a bit in the tech spectrum, there is a radio museum, chock full of these... radios that do not have transistors or ICs. Vacuum tubes are the thing in this building. Lots of glowing, heat-producing vacuum tubes. Despite the heat...very cool stuff. 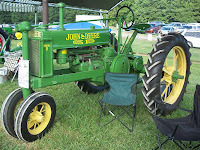 There are also vendors of all the parts, pieces and services needed to repair and restore these old beasts of burden. 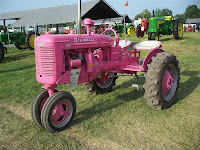 No pictures; how many bins of various size hitch pins and piles of old fenders and so on do you need to see? There are also other vendors, with items near and dear to the hearts of folks who are preparing for The End Of The World As We Know It. 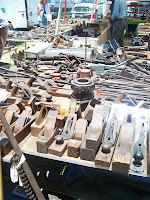 For those working toward the goal of "generational survival", a threshers reunion is a gold mine of books, instruction manuals and tools of all kinds for trades such as blacksmithing, horse shoeing, wood working, low tech farming and more. It's also a place where you are highly likely to meet like minded people. I was astounded at the number of people I either spoke to or overheard who were, in very matter of fact terms, discussing publicly how they were planning to live either after A) petroleum is not available as cheaply as it is now or B) The Obama completely sinks the country into the muck. And completely unashamed about discussing the subject with absolute strangers. All in all, it's a great way to spend a day or two. Unless you're wearing an Obama hat. Edit, 2258: Greetings and salutations to the Tamalanche. Thank you for the linky-love, ma'am. Edit, 7/12/2009, 16:47: If you want to see more on the SETU, I've done another post, available here. It seems that the death of Michael Jackson has spawned a cottage industry on YouTube. Warning...this isn't quite work safe.